Arsenal China net (www.arsenal7.com) was launched by the Arsenal Fans Association of China in January 2004 with the mission of providing Arsenal fans in China with the most up-to-date and most exciting news about Arsenal, promoting and spreading the Arsenal footballing spirits, creating the largest Arsenal community in China, and providing Arsenal fans with a platform of free exchange. 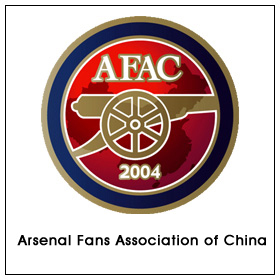 Arsenal China net is also an open platform which welcomes the participation of fans from all over the country of China. It is our sincere hope that visitors will acquire more information about Arsenal, and connect to Arsenal fans in the whole world. Arsenal China net operates the following channels: homepage, fans’ forum, news centre, live video channel, a video archive channel, download centre, electronic Arsenal magazines in Chinese, Arsenal babes, and the Arsenal games channel. Other channels will be added over time. In particular, the fans’ forum (bbs.arsenal7.com), boasting 1,000,000 registered users, is the largest Arsenal forum in Chinese language.